The Colombo Municipal area has about 1,158 unauthorised pavement hawkers, a survey conducted by the Police Environmental Protection Division of the DIG’s office, Colombo revealed. Police revealed the statistics at a discussion with Provincial Councils and Local Government Minister Faiszer Musthapha at his ministry. According to statistics, Colombo has about 720 pavement hawkers of which 633 are in pavements in Pettah. The pavements hawkers are mostly on 1st Cross Street, 2nd Cross Street, 5th Cross Street, Malwatta Road, Olcott Mawatha, Main Street, Bodiraja Mawatha and Gas Paha junction. There are also 221 unauthorised lottery counters in pavements. Of this, 36 are in Pettah. About 120 unauthorised mobile vehicles trade in pavements and 49 are also in Pettah. There are 45 unauthorised newspaper sellers along pavements and 12 of them are in Pettah. In addition, there are 52 unauthorised carts where traders sell their goods. Minister Musthapha instructed officers of the Colombo Municipal Council and Police officers to remove the pavement hawkers immediately. The survey also revealed that there are 116 unauthorised advertising boards in Colombo. Provincial Councils and Local Government Ministry officials organised the discussion to obtain views of different parties to implement a proper procedure for traders in the Colombo Municipal area. 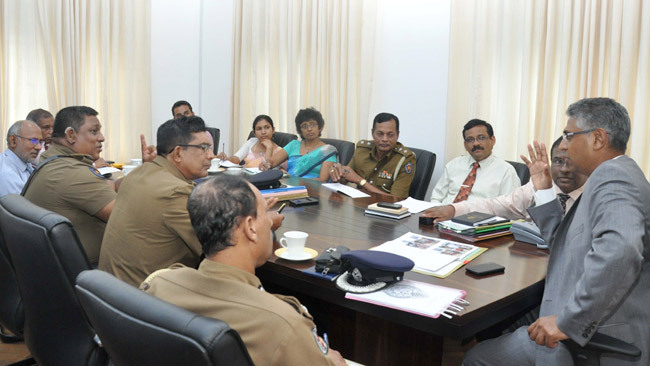 Provincial Councils and Local Government Ministry Secretary Kamal Padmasiri, officers of the ministry, CMC, Road Development Authority, DIG’s Office, Colombo, Police Traffic Division and the Police Environmental Protection Division were present at the discussion.